Hawaii Loa Ridge is a luxurious and secure gated community on the island of O’ahu, in the city and county of Honolulu, Hawaii. Homebuyers who choose to search for a home in this exclusive and private oasis will be enthralled with the gorgeous homes available for sale in the community as well as the amenities and activities that are situated nearby. 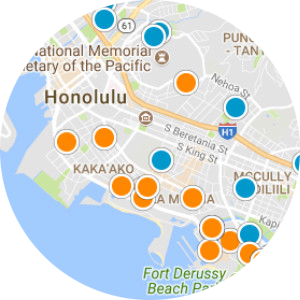 Buyers looking to live in the Hawaii Loa Ridge neighborhood are able to head out for a day of shopping the latest trends and highest fashions, dine out at excellent restaurants, or spend the day relaxing at a nearby beach or bay with those closest to them. Art and culture play a big part in the way the neighborhood runs, and residents can visit galleries and museums as well as attend shows. Prospective homebuyers in search of single-family homes for sale in Hawaii Loa Ridge will be pleased with the available options. Open-concept estates and houses can be found in the neighborhood with floor to ceiling views, letting the natural sunlight rise and set in the residence. Homes with maid’s quarters and separate guest rooms can be found in the community as well as houses with tennis courts, pools, and private saunas. Lush landscaping and the proximity to the ocean water and beaches are some of the scenic perks of living in this particular paradise. If you are interested in buying a home for sale in Hawaii Loa Ridge, Hawaii, please contact us today.